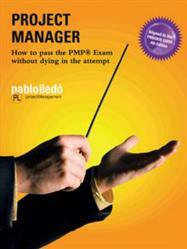 With the release of his newest study guide, Project Manager: How to pass the PMP® Exam without dying in the attempt (published by Trafford Publishing), author Pablo Lledó knows he’s on to something big. Available in paperback ($24.90) and as an e-book ($9.99), Lledó’s newest PMP® exam guide is the author’s sixth project management reference book. Pablo Lledó is the author of six books: Director de Proyectos, Administración de Proyectos, Gestión de Proyectos, Administración Lean de Proyectos, Claves para el éxito de los proyectos and Project Manager: How to pass the PMP® Exam without dying in the attempt. Lledó is a certified project management professional and has earned a master’s degree in project analysis and a MBA in project management. For more information, visit http://www.pablolledo.com.